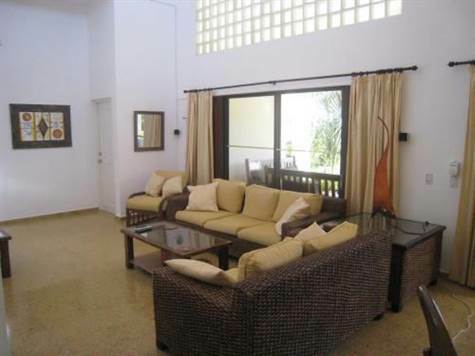 The Ultimate request we get is a Villa on Cabarete Beach---this is it. Steps to the beach and all the restaurants, clubs, and shopping in downtown Cabarete, this is is one of the only beachfront complexes of houses in Cabarete, and is highly prized for its convenience and rental value. Safe, great on-site management so your ownership is worry free, this open and spacious villa has high ceilings throughout. A huge covered terrace close to the pool catches the onshore breeze offering one of the most comfortable settings you will find in Cabarete. Absolutely worth a look---you may end up living here!